If you are working full time, becoming a trader is quite a challenge. Do you consistently fail to sell at your set stop-loss because you were doing something outside the market? Have you missed on your reversal and bounce plays many times already? Are you always not able to catch up with the latest news and disclosures? Most part-time stock traders in the country don’t have the luxury to monitor their positions while they are working on their day jobs. On the other hand, students who also trade stocks need most of their attention directed at their subjects and professors while the market is open. People on vacation also share the same difficulty as they can’t have their eyes glued on their phones or monitors during market hours. Because of these reasons, we might miss out rapid changes that take place during the opening hours of the market. 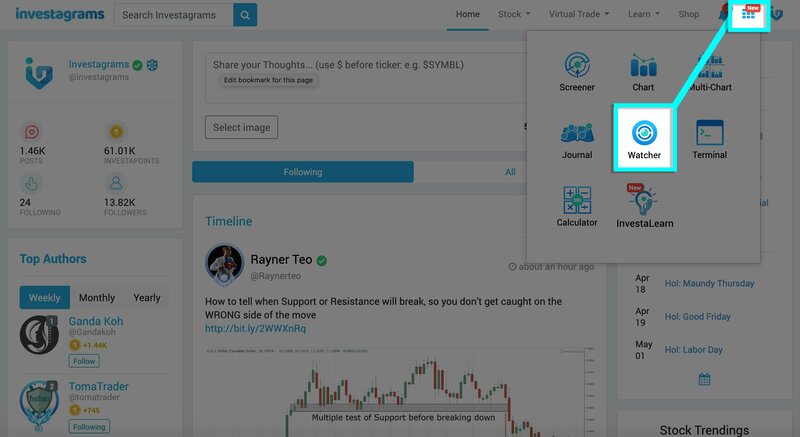 Every second counts for us traders and having an alert system for stocks will help us save time and money as this will allow us to respond to any price movements as they happen real-time. Given that almost all stockbrokers in the country do not feature stop-loss orders, this would be a godsend to those traders who are dealing with cutting prices or stop-losses. We need not to stare at the glaring screens of our electronic gadgets every minute just to be able to catch up with price movements. That’s where the InvestaWatcher comes in. 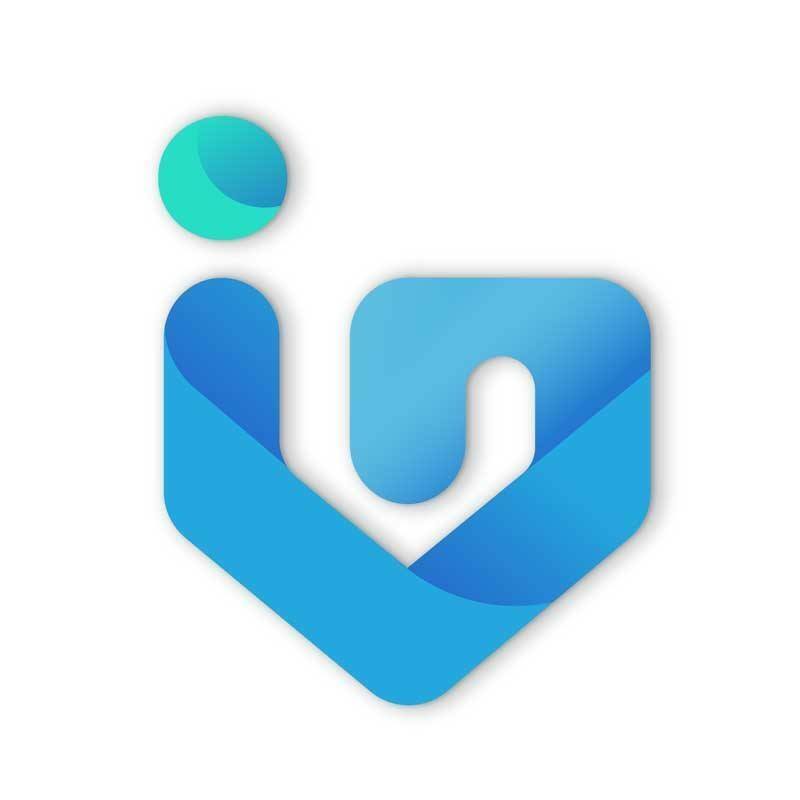 Since 2016, the InvestaWatcher has helped countless of local retail traders with their trading executions. No longer is it an excuse to miss out on a breakout play that could’ve netted you 10% plus gains in one day because you were too busy with something. 1. Click the “Watcher” tab on the right-hand side of the chart under “Tools”. 2. Select the “eye-like” button or the “plus sign” beside the “Watcher Setup”. 3. A small tab like the one below will show up where you’ll input necessary data. 4. 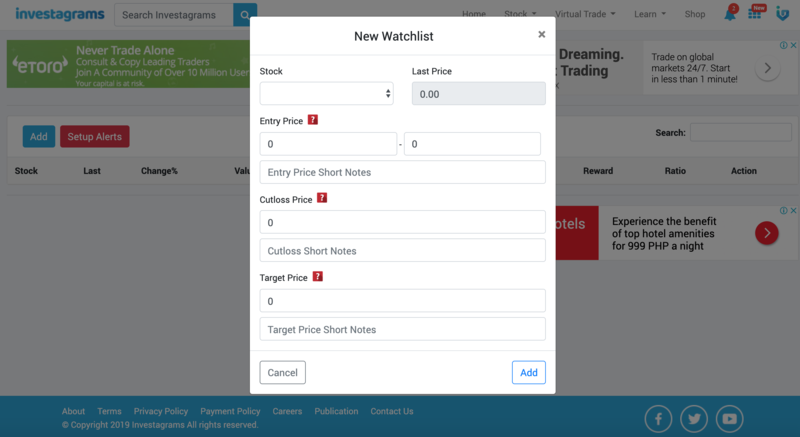 An alert will be sent to you as it hits your set prices (Target and Cut Loss) or when it releases a news/disclosure. 1. Select the blue navigator below beside your account’s default picture then choose “Watcher”. 2. 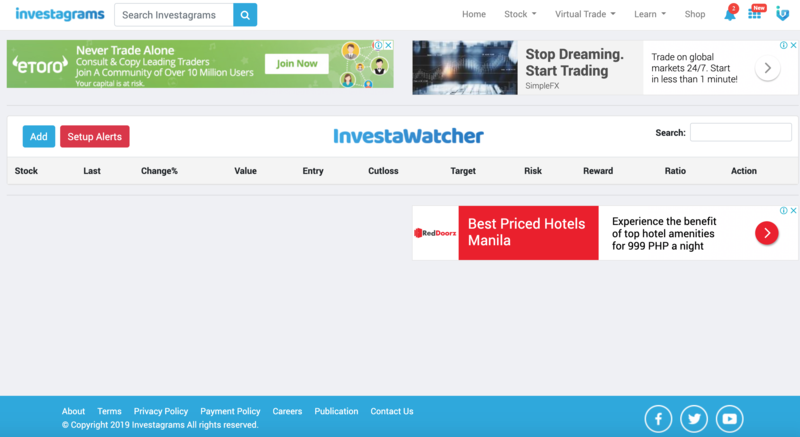 You’ll be taken to the InvestaWatcher’s main tab where you can add stocks and setup alerts. 3. A small tab will pop-up like the one below. 4. 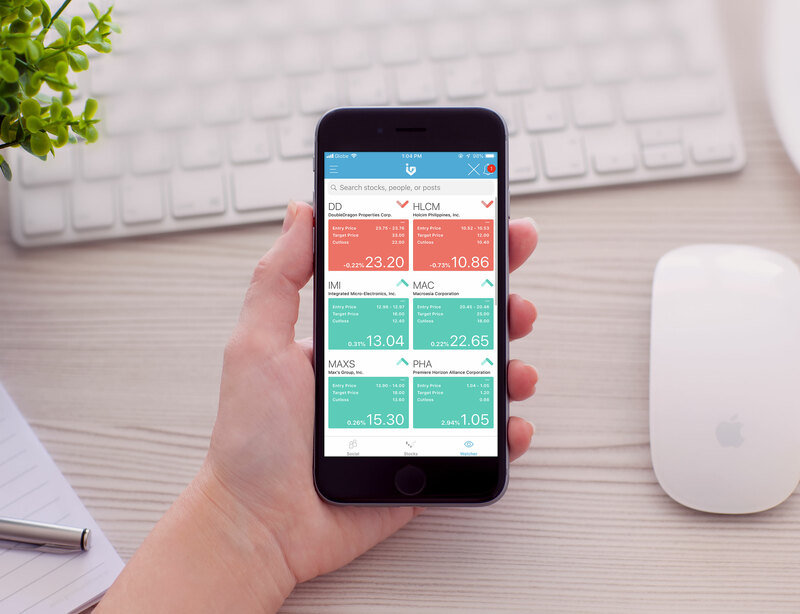 An alert will be sent to you as it hits your set prices or when it releases a disclosure. The InvestaWatcher will alert us through email, sms, or even in our Facebook Messenger accounts. So, it basically covers all the channels needed to alert you. As a trader, we know the amount of effort we put in our trading plans. But a well-baked trading plan won’t necessarily grant us the reward we’re looking for, execution serves as a bridge between our trading plan and the market. Actually getting in the swing and the huge moves of the stock we want to trade in the most precise way is tougher than creating a trade plan, given outside variables that might affect the way we execute our trades. We might be patting ourselves in the back when the stock we made a trading plan for actually went upwards. But our goal in the market is to make money consistently. 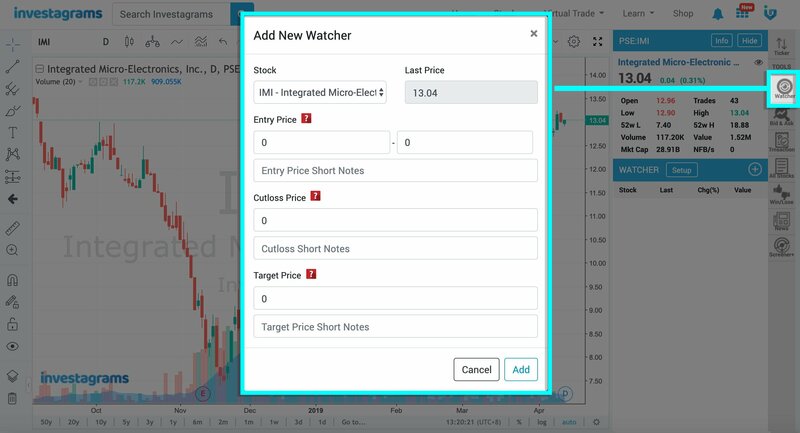 With the InvestaWatcher, our executions will be better, more efficient, and precise. For more information about the InvestaWatcher, click here.